To keep any belt conveyor running properly, it is important that you are able to correctly track the belt. In this blog post, we will walk you through conveyor belt tracking basics for most belt conveyors. To track a belt you will be using the idlers, pulleys, product location, and belt condition to control the direction of belt travel. The first step is to make sure that your conveyor is installed squarely and that the belt you are using has been cut and spliced correctly. If a conveyor has been installed out of square or the belt is not properly cut or spliced, tracking the belt will be a difficult or impossible task. Next, you will need to verify that your belt is under proper tension. You can determine the proper tension for your particular style of belt by contacting the belt manufacturer. 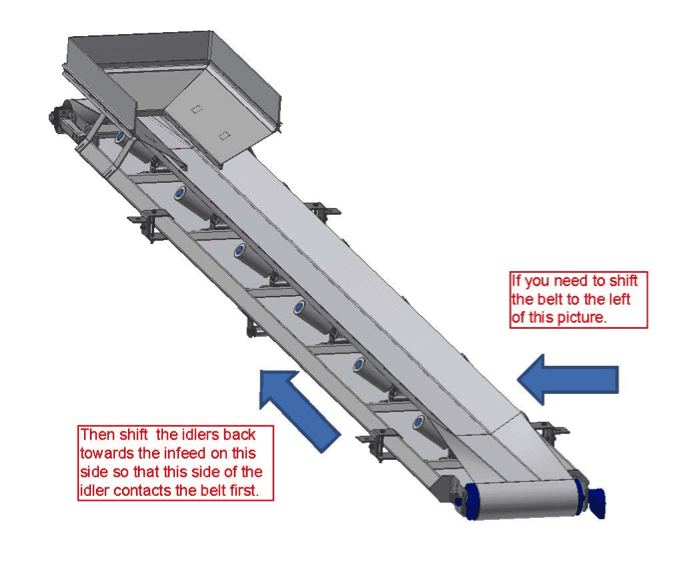 Use the adjustable take-ups on the conveyor to set that belt tension. Keep in mind that it is absolutely imperative to align the pulleys so that they are square to the bed of the conveyor. Now, you are ready to check your belt travel and track it. When tracking a belt, you will want to start with the conveyor running empty with no product load. Additionally, you will want to run the belt a few rotations after each adjustment to allow it to work in each change before making any additional adjustments. One rule of thumb for belt travel is that the belt will move towards which side of the roller it contacts first. You will use this rule as you make adjustments in the idler rollers. When tracking the belt, the idler rollers should be the first rollers you adjust. Some conveyors will only have return idlers and some may have idlers on top, such as troughing idlers, that can also be adjusted. You will need to shift the idler(s) so that you move the end of it towards the side of the belt that you want the belt to track towards. This can be seen in the illustration above. Only use the head and tail pulleys as a last resort when tracking. These should typically remain square with the bed of the conveyor. Once you have the belt running correctly you will then run it with the product and verify that the product is being fed to the center of the belt. If it is off center, you will need to use a chute (as seen above) to correctly center the product on the belt. Hopefully, this article will assist you in tracking your belt conveyor. If you still need assistance with tracking belts, we would be glad to talk to you about setting up one of our highly trained service technicians to visit your plant. Our technicians can work on correcting any tracking issues you may have, and they also offer hands-on training. In addition, we can offer automatic belt trackers that can be customized to virtually any conveyor. If you would like to discuss conveyor belt tracking basics or any of our belt conveyors in more detail please contact Cory Crawford, our service manager, at 865-966-5866 or ccrawford@smalleymfg.com. Thanks for pointing out that the conveyor should not be spliced or cut since it means that the belt is not installed properly. I will share this information with my uncle because it appears that they will be buying materials this weekend for their factory. As of now, they are still looking for a company that they can trust. But this tip will help them ensure that they will be installing the materials properly.